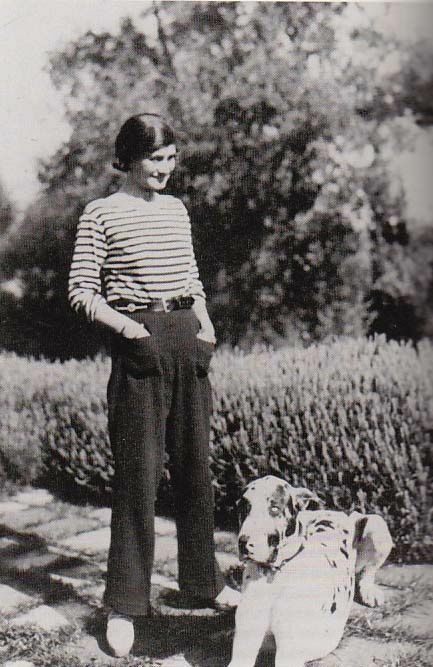 Coco Chanel and a Great Dane. I’ve realized that the well-dressed people I most admire wear uniforms. Emmanuelle Alt has her black stilettos, jeans, and white shirts. Jeanne Damas is always tucking shirts and sweaters into high-waisted pants. Giorgia Tordini can WORK some menswear, and hence usually does (I’m more than a bit in love with her). Grace only wears black now. Jonathan wears black and white. Such people have a very specific, recognizable, and definable personal style. This interests me deeply. I think this is what people mean when they say that someone has “great style” — it’s concrete and identifiable; it does not bend to the seasonal whim of sartorial trends. A uniform is certainly an appealing concept. It is not surprising that the article Matilda Kahl wrote for Harper’s, “Why I Wear the Exact Same Thing to Work Every Day,” sparked such a frenzy of internet interest. We take people who wear uniforms seriously. It appeals to our deep need to feel orderly and distilled in our daily life. But what does this mean for someone like me, who is neither (a) courageous enough to wear the same thing to work every day nor (b) inherently gifted in the art of choosing and wearing clothes? Name what I like and why. Continue to fall into that visual rabbit hole that is Pinterest (with which I am unabashedly in love). Study well-dressed people. Take note of why I keep pinning the same images and over and over again. It turns out that I am a perennial sucker for a woman in (a) button-down shirt and (b) a classic men’s shoe. Be exceptionally clear about what I like and dislike. Wear and use what I have. I do not need more things. I have checked off some of the more expensive staples from my wish list this year (silk shirts, cashmere sweaters), and they should ideally last a long time. I am set. Say this to myself and believe it. Talk to stylish people and glean their wisdom. I like doing this anyway, but I want to do it in a more structured, disciplined way. I am hoping to feature a few of these people here in the weeks and months to come, so stay tuned. Here it is! I am proud of how bad this collage is and how decidedly un-cool-lady-blogger it is. How about you? Do you ever think about this? What garments would compose your daily uniform? I’m still a university student so it’s such a big deal to me what to wear to school everyday, but just like you and Matilda that it is not fair at all when men can throw anything on their bodies without concerning of being judged by people around. And even they do, they can comfort theirselves that men were born to do great things, not to think about what they will wear like us women. I wear hiker boots, jeans and hoodies, sometimes gray and sometimes bright orange. Almost all the time. And I always go for comfort, practicality and utility over anything else. Perhaps I should rethink the uniform I wear. Oh, and I guess a part of this comment ought to be that I am a woman. My uniform, that is to say my comfortable second skin that I feel all powerful and confident and 100% me in, will always be an all black ensemble. Not for thinning purposes (bc I’m barely over 100lbs as it is) and not for some sort of statement that I’m goth or too serious or embracing my inner Johnny Cash but because it is me and it makes me feel good and it makes me feel I can conquer the day no matter what’s ahead. Which I think is what our uniform should be to us. Our suit of armor for the day ahead. Ya know I have tried and failed miserably to stick to uniform,even though I would rather. I find my whimsical nature constantly torn between here and dreamy past lives,for instance I would love Elizabethan anything and drum in American Lokata garb or lounge in Marlene Detriech comfy pantsuit. See what I mean. They are all my uniforms,love.